For use in classrooms or during presentations, this poster displays the Elements of Thought. Can be used alone or in conjunction with theothers in the set. This poster further defines the Parts of Thinking Poster. 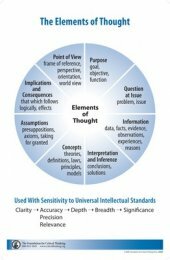 552P Elements of Thought Poster $4.95	 Qty.